While visiting Sonoma County recently, we found an old friend we hadn’t seen for years. 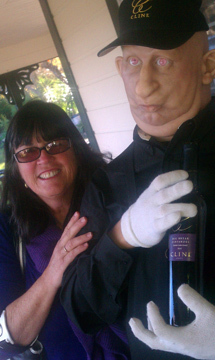 At the very southern bottom of the county there is a winery we visited over 10 years ago, at the beginning of our wine journey – Cline Cellars. Back then our tastes struggled with the heavy tannins in many California wines. In fact, on our visit here all those years ago, I leaned on the counter and said, “We don’t like tannins for the sake of tannins.” The woman behind the counter (who really looked like Doris Day) leaned across the counter and said, “Neither do we.” And she poured us some wine we fell in love with. One of those wines is Ancient Vine Carignane. Over the years we saw it disappear from stores and we thought perhaps they had plowed their fields under for the more noble grapes, fruit like Pinot, Zinfandel, Merlot, Mourvedre, Grenache, etc. We’re happy to report they never gave up on Carignane and we were able to find it again during our visit. It turns out that it had been too cold to grow abundant Carignane and their bottling declined to 350 cases. It disappeared from retail store shelves. But the good news is the weather has warmed up over the past couple of years and we can now buy it again. We give this wine a ✰ +. Besides tasting Ancient Vine Carignane we tasted and enjoyed their Cashmere (a classic GSM – Mourvedre, Syrah and Grenache blend), their Ancient Vine Zinfandel (from Lodi – a great Zin growing area) and then, on to their reserve wines. Dave, our host lined up four glasses and poured each one with a different wine. We agree! 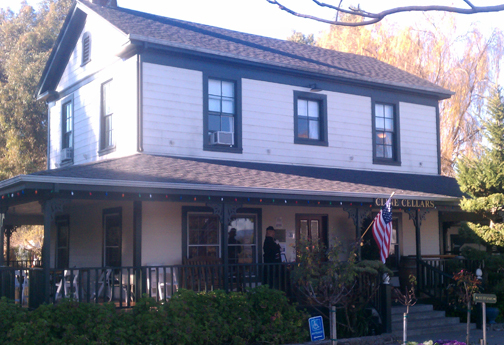 Cline Cellars sits on 24737 Arnold Dr. as you enter the Sonoma area from San Francisco. This entry was posted in California Wineries - New World Wines, Sonoma, Thoughts About Wine - Exploding Ruby Flowers On Your Palette, Vinotypes and tagged bottle, california, carignane, old, sonoma, vine, wine, wineries.